HHCF event a smash… RZA wins Kings Invitational! Front to back: RZA vs. Monk, Ralek Gracie vs. GZA, Amir vs. Casual, Sunspot Jonz vs. Paris. Photo by Daaim Shabazz. 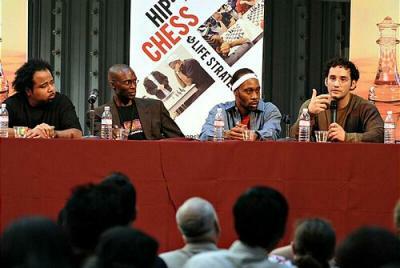 The Hip-Hop Chess Federation held it 1st Annual Kings Invitational tournament and 3rd event overall. Hundreds of people attended the spectacle and it was indeed a rousing success. The event was held in the spacious Galleria at the San Francisco Design Center and the decorations throughout the hall provided an elegant ambiance for the event. There were several side events including a scholastic tournament a "Hip-Hop, Chess and Life Strategies" panel featuring IM Josh Waitzkin ("The Art of Learning"), RZA (Wu Tang Clan), Daaim Shabazz (The Chess Drum), Rakaa Iriescience (Dilated Peoples). Each reflected on the important linkages of various disciplines. 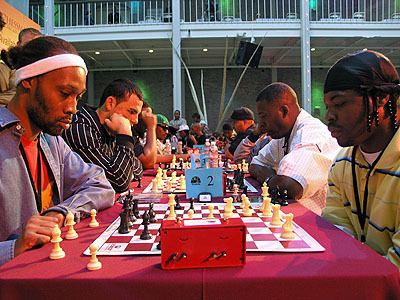 Waitzkin focused on his synergy of chess and tai chi; RZA talked about his experiences when traveling to the Shaolin Temple; Shabazz discussed the introspective, metaphysical nature of chess and universality of the game; Rakaa discussed chess and the links with music. The stimulating discussion lasted roughly 45 minutes followed by a Q&A with an attentive audience. The next event was the bullet match between United Kingdom under-11 champion Emma Bentley and world-class emcee, DJ QBert. When DJ QBert did not show, mixed martial arts fighter Ralek Gracie (from the famous Brazilian Ju Jitsu family) volunteered and was quickly mated after 1. Nc3 e5 2.d3 Bc5 3.Nb5 a6 4.Na3 Qf6 5.e4 Qxf2 checkmate! The main event was the Kings Invitational featuring RZA (Wu Tang), GZA (Wu Tang), Amir Sulaiman (spoken word artist), Ralek Gracie (mixed martial arts fighter), Casual (Hieroglyphics), Sunspot Jonz (Living Legends), Monk (Wu Tang) and Paris (Guerilla Funk). Dr. Alan Kirschner of CalChess directed the event and spent a great deal of time explaining the rules to the players, none of whom had played in an organized tournament setting. Once the games started, it appeared as if RZA would sprint to victory after winning his first three. GZA, who had earlier lost to RZA, brutally mated Gracie putting him on 3-1. Meanwhile, RZA was in an intense battle with fellow Wu Tang member, Monk. There was intensity in the air as Monk developed a strong attack on RZA's centralized king. RZA had to jettison a whole piece and would later lose another exchange. With a rook deficit, he was plodding on to an imminent defeat. Presuming Monk beat RZA, there would be a three-way playoff between Monk, RZA and GZA, all of whom would have 3-1. Monk was moving quickly and focused on cornering the king with his two rooks, but then something amazing happened. 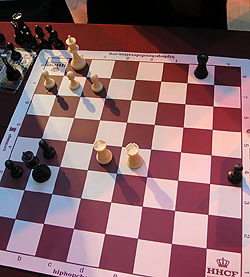 RZA slammed his lone black rook down on the b1-square and trapped white king's for a back rank checkmate! This caused a buzzing around the table. No one could believe the turn of events! Monk was absolutely mortified. GZA told him, "You'll be thinking about that the rest of your life." Indeed. A rook down with no compensation, RZA dropped Rb8-b1+ with mate in two! RZA holds up the HHCF championship belt after sweeping the tournament 4-0. 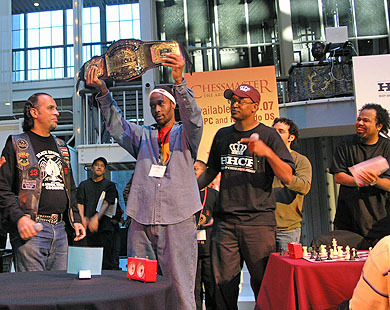 Hip-hop legend "Popmaster Fabel" presents the belt while Adisa Banjoko (co-founder of HHCF), Josh Waitzkin and Rakaa Iriescience applaud. Photo by Daaim Shabazz. Stay tuned for info on HHCF's Queens Invitational on February 19th!